In only 45 minutes, you get a complete class in building a key component of any workshop with Build a Router Table. 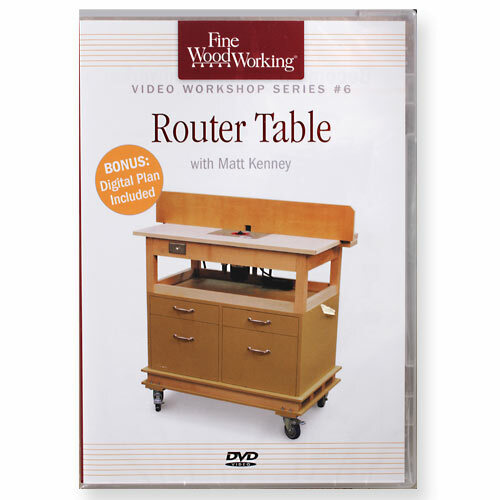 The guru of routers, Matt Kenney walks you through all the basics on this DVD, that includes a Bonus SketchUp Plan. Build a solid table that speeds your work. Invest a little time and you can easily construct this essential work surface. It will secure your router and provide a reliable and maneuverable fence to guide your stock. Great for ease of working and safety. Get more from your routers. See how Matt uses an accessory lift with a conventional fixed-based router, works a router with built-in lift technology, and deals with dust collection. You'll also learn how to build a variety of accessories, including push sticks and clamp devices. Plus, get a refresher in basic techniques. Whatever your skill level, you can learn something new watching Matt put a router through its paces on this great new table. Color. 45 minutes.